Rockin’ it like nobody’s risky business! Dance to your favorite 80s’ hits 9pm to 1am in the Beach Rock Lounge. The Spazmatics come complete with their own special brand of 80s’ antics, including the occasional DEVO hat experience. 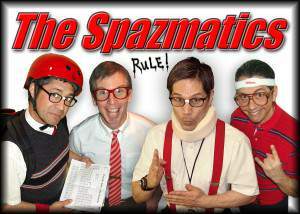 Complete with high water pants, pocket-protectors and nerdy glasses, The Spazmatics recapture all the best of the worst. Outstanding musicianship- combined with creative flair and style- makes for an evening of pure energy and entertainment. So tonight we’re gonna party like it’s 1999, only . . . it’s not.